Dear Traders, another forex technical indicator from oscillators family. As other oscillators, it also indicates the oversold and overbought situations. Generally, a straight line is drown at 0 level, which is not drawn here. 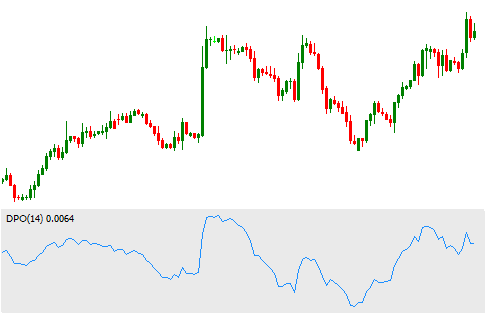 You can draw the straight line while inserting the indicator into trading platform. Along this post you will learn the way to trade forex with DPO technical indicator. The interpretation of this technical indicator is simple. A sell order is suggested to be placed when the indicator gives a reading at overbought level, and cross the zero line from up. A buy order is suggested to be placed when the indicator gives a reading at oversold level, and cross zero line from down. A sell signal suggests to close a buy order, and a buy signal suggests to close a sell order. The default period of this indicator is 14, but you can choose any period depending on your trading strategy. The popular bullish divergence and bearish convergence techniques can be applied with this technical indicator. Many traders will replace it with RSI Oscillators. I hope this post will help you to enrich your trading experience.